Tippy, myself and Miss Machine, took stock of our situation and my companions decided, with some gentle persuasion on my part, that our best option was to dig a tunnel. We aimed to begin this task at the south wall of the cellar under the playground (above which our deadly feathered fiends were still squawking loudly), and dig our way out onto the steep bank of the river, a mere half a mile yonder. Gathering the now (thankfully) docile children, we armed ourselves with a variety of spoons and began the task of hacking away at the (again, thankfully), soft clay we found after removing a portion of the cellar wall. In less than six hours, we had tunnelled almost three feet and just as I was beginning to think our work would never end, the roof of our lowly tunnel collapsed. When the dust had cleared, I peered upwards and saw to my joy a glimmer of moonlight (for night had now fallen). Listening out for the slightest sound, I immediately noticed the lack of squawking – the birds had gone! I determined to forgo our tunnelling venture and spirit away, under cover of darkness, myself, the girls and the children, up through this narrow passage, across the playing field to the river and safety. I had, however, given in too readily to the idea that the birds had deserted their posts, for no sooner had I engineered to have all of us out onto the grass, than a loud squawk echoed across the land. In seconds, the savage creatures were upon us, clawing and shrieking like clawy, shrieky things. I recall thinking that I should have listened to Holmes, when a sudden brightness caught my eye. Across the playing field, dozens of lights were hurtling towards us, their sharp beams slicing through the darkness like shite off a hot shovel. The sudden interruption startled our attackers and the creatures rose up as one, leaving us momentarily free. At that point, someone grabbed my arm and I turned to stare into the soft, squidgy face of my old school chum Jessica Fletcher. “Come, Johnny, come,” she yelled and turned to run back through the crowd of individuals who I now know as the local Light Aircraft Fanciers Society, their heads somewhat curiously adorned with propeller hats, and each of them waving a large torch. Surrounded by our saviours, we were hurried across the grass to a waiting motor launch, where a certain Captain Jacqueline Sparrow had hot buttered scones and tea ready and waiting. Jessica gave me one of her famous winks and muttered, “Oh, don’t you worry, Johnny, I’ve got plans for you…” And with that she slid her hand down my trousers. I won’t go into all the shenanigans that followed once we were snuggled up in the safety of the ‘The Frigg and Whippet’ in Cabot’s Cove – suffice to say Jessica rounded things off rather masterfully, revealing the culprit behind the apparent madness of the bird population. Performing one of her famous unmasking ceremonies, Jessica gathered us all together and asked our friendly local school teacher, Miss Florence Machine, to step forward. With a sudden upward swing, Jessica smashed a four-pound hammer into the poor woman’s face. I see now that it was perhaps rather remiss of me to scream quite so shrilly, but in my defence, I was truly shocked by what I saw. As Florence’s’ face literally slid off and crashed to the floor, the mess of cogs and chains inside her head left no doubt as to who, or should I say, what, she really was. I imagine the idea of naming her ‘Miss Machine’ was one of Moriarty’s sick jokes, for it is he (I am convinced) who is the real mastermind behind this madness, and he, also, who created the thousands of mechanical birds who (thankfully, yet again) have now all been destroyed. As a footnote to this episode, a northern film director has asked if he might utilise the remains of the previously mentioned mechanical creatures, as he has a plan to make a ‘moving picture’ detailing our adventures. Dear Tippy, too, has been approached with a view to portraying herself in what sounds like a pretty unrealistic plot. 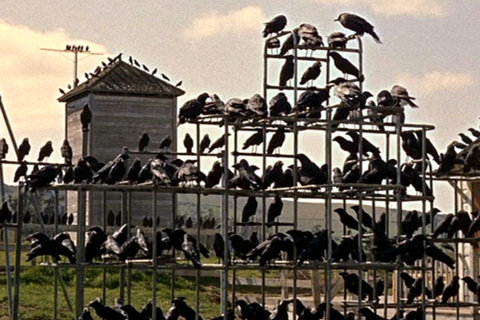 I mean, mechanical birds are one thing, but no-one would ever believe a plot centered around the idea that several thousand starlings could turn against the human race. Whatever you do, make sure the Premises are secure – whatever means you can find to turn the building in to a Fortress – do so – your lives may depend on it; I am working on a Plan to rescue yourself and the others. By the way, do not reveal any salient information to Miss Machine – I have a sneaking suspicion she is not what she seems. I am sure I have seen those flaming-red locks in the company of our Arch Nemesis, which leads me to the conclusion that she is mixed up to an incriminating degree in this Horror. Have you heard me talk of Big Jack Horner – the veteran Palaeontologist from Montana USA? He has been attempting to turn a domestic chicken in to nothing less than The Terrible Lizard (extinct, I know), Tyrannosaurus Rex for as long as I can remember – we all thought he should be rubbing shoulders with Away-With-the-Fairies Richard Dadd in the Insane Asylum, but it looks as though he may have been helped along his twisted plan by none other than Moriarty’s interventions. Much as it pains me to contemplate such things…I know I have perhaps caused your brain cells to collide in confusion with these revelations, but I do indeed think that this is the Cause of your calamitous situation. Whatever you do – do Not venture Outside. Thank you for your telegram, which I received yesterday morning, but I have to inform you that such matters as disgruntled librarians are the least of our troubles. As your messenger will have no doubt confirmed, myself and Tippy are at this very moment trapped in the schoolhouse on Seagull Lane (together with an agitated teacher and several screaming children), surrounded by thousands of birds – the dreadful creatures can be seen gathering on telephone wires, tops of walls and in the trees surrounding the playground. On our arrival, it was plain to see that our formerly-feathered-friends, were gathering in great numbers all around the school. Even as Tippy and I made our way as quietly as possible and with the utmost care to the front door, the activity of the birds became more blatant. The creatures clearly have a leader – a large eagle who has perched himself rather worryingly on top of the children’s swings. Once again, I am reminded of a certain acquaintance of ours whose features seem indelibly part of that noble bird’s dominion. Yes, Holmes, I know it’s ridiculous but I am convinced that Moriarty is somehow a part of this whole bird-related episode. Urging the teacher and children to withdraw to the uppermost floor of the building, it was at this point I noticed a flashing light from a house in the distance. At first I thought I was imagining it, but then I realised someone was transmitting Morse Code. Scribbling down what I could grasp of the sender’s message, I soon deciphered it. However, since it concerns the cleavage of a certain barmaid at the Hog’s Head Arms, I have no need to reiterate the contents of that message. I whipped out my own make-up mirror (I’ll explain later) and began flashing in the direction of Major Tom. Thankfully the Major quickly grasped the details of my predicament and signalled that he would contact you as soon as humanly possible. I think he was a little annoyed at my insistence on sending such a lengthy communication when I could more easily have condensed it into a few words, but I know how you like to be informed of all the relevant details. In short, Holmes, please come quickly.